Frogs Heaven; It really was a paradise! In a pretty remote part of northern Costa Rica (Horquetas) where most people visit only to go white water rafting, it might appear hard to find activities to do (click to read activities with kids in Sarapiqui) – especially in the dry season, but there’s so much more than just the river. 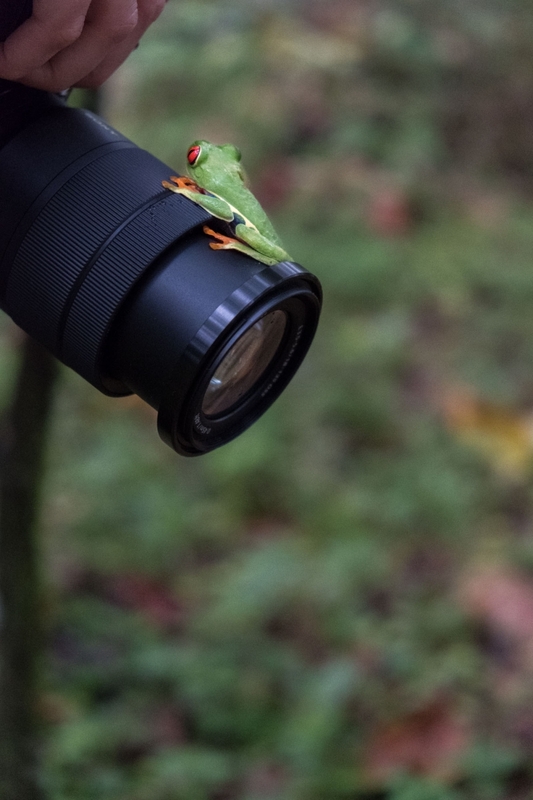 We managed to find a family run, organic and biological project called ‘Frogs Heaven‘ where we were able to observe and photograph many different species of frogs, birds and plants with a perfect tour and commentary in English. 3 The red eyed, green tree frog! Frogs Heaven is in Jose’s garden – and he designed it whilst he was studying for a BSc in Biology. He has since graduated and is a biologist studying the Costa Rican environment. It’s a pretty big garden by the way and Jose goes out of his way to plant bird and insect friendly plants. Some people have criticised the garden for being a con because the frogs are too easily found however the reason behind this is quite simple. Frogs don’t move particularly far, they remain in their territory, which is why these frogs are easily found. We saw four species of frog whilst we were there: glass frog; red eyed green tree frog; poison dart frog and the blue jeans frog. Each frog was less than about 5cm in length with the smallest being the blue jeans. Although ironically I think it’s also the most toxic. Our son watching the green tree frog at frogs heaven. The red eyed, green tree frog! 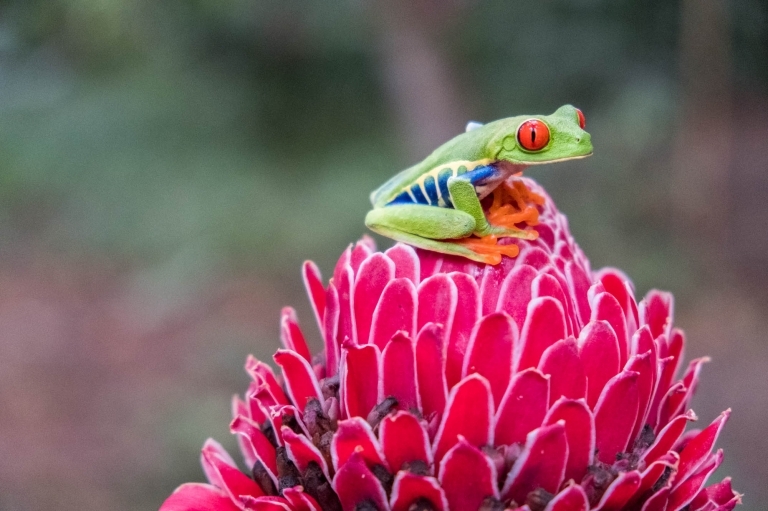 The red eyed, green tree frog is an iconic rainforest critter of Costa Rica. It’s on every cereal box, kids’ book, poster on every schoolroom wall and it’s featured heavily in Costa Rican marketing photos. Thanks to all this exposure, it’s possibly the most charismatic and easily recognisable of all frogs too. The species has red eyes with vertically narrowed pupils. It has a vibrant green body with yellow and blue, vertically striped sides. Its webbed feet and toes are orange and sticky. 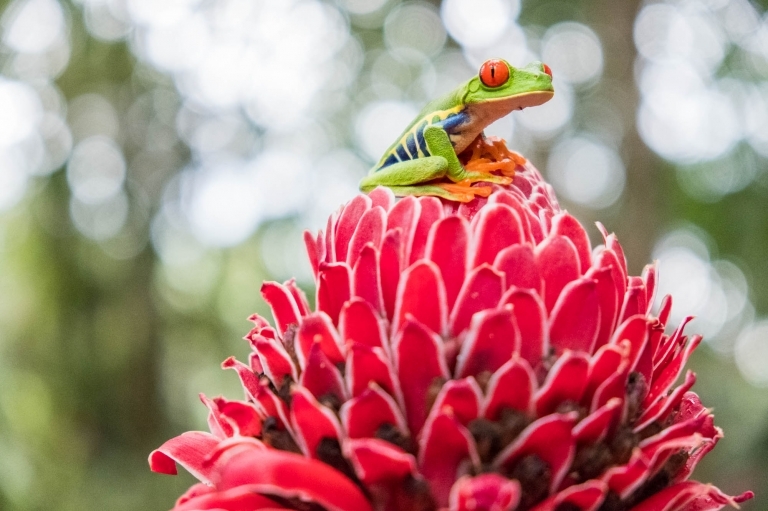 The red-eyed tree frog remains tucked away during the bright daylight hours and camouflages itself inside green leaves. Once tucked up, the frog blends in as it is all green and really quite small. It’s only at night that it comes out and shows off its vivid colourings to warn predators away. When a red-eyed tree frog detects an approaching predator, it abruptly opens its eyes and stares at the predator. The sudden appearance of the red eyes may startle the predator, giving the frog a chance to flee. The frogs lay their eggs inside the folds of the leaves so you’d never know they were there. It’s impossible to get a bad photo of these guys and the kids were enthralled with this little one who allowed us to watch him for a while. Poison dart frog (also known as poison arrow frog) is the common name of a group of frogs which are native to tropical Central America. These species are diurnal and often have brightly colored bodies ranging from turquoise to bright red. This bright coloration is correlated with the toxicity of the species which is derived from their diet of ants, mites and termites. The frogs are often called “dart frogs” due to the indigenous use of their toxic secretions to poison the tips of blowdarts. This little fella (roughly a few cm long) is known comically as the blue jeans frog due his distinctive blue legs however he is actually a strawberry poison-dart frog. The tiny frog makes a loud and distinctive “chirp-chirp-chirp” which is easily heard and mimicked by naturalist guides. It makes it one of the easier frogs to find on the forest floor. The bright coloration is a warning to predators that they are is toxic and despite being so small, males are incredibly territorial and when provoked will jump on top of another male, wrestling him for up to 20 minutes on their hind legs. Although this little frog is lime green in colour, it gets its name from its see-through stomach. You can see on the photo a small black dot above its groin. This is the contents of its stomach! Glass frogs are small criters that range in size from 3 to 7.5 cm in length and they differ from lots of frogs because their eyes face forward, rather than facing to the side. These frogs are mostly tree dwellers and typically live along rivers and streams during the breeding season. They are particularly diverse in montane cloud forests of Costa Rica. Jose’s garden is FULL of flowers, most brightly coloured and scented to attract as many creatures as possible. Sadly I don’t know the name of this flower and my plant apps haven’t identified it. Beautiful colours though! 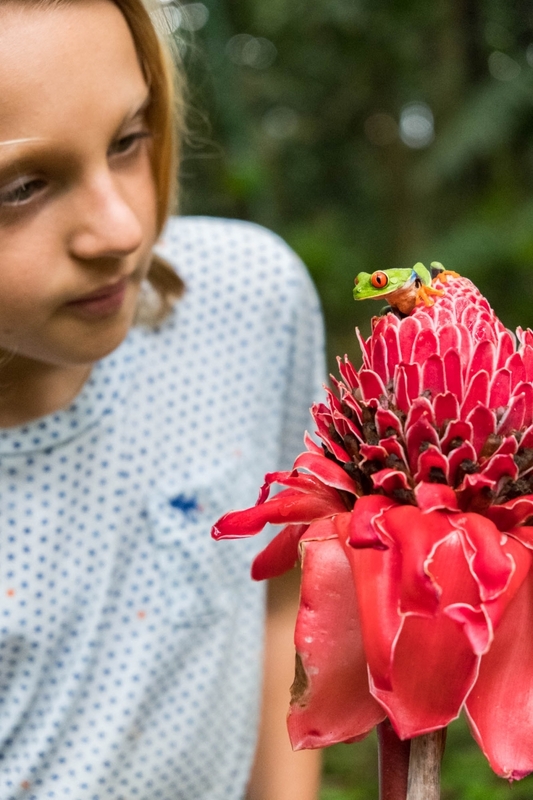 This is Imogen, gently squeezing the Maracas Flower also known as Shampoo Ginger. The majority of gingers in Costa Rica are originally from South East Asia from where they were brought over as ornamental garden plants. This flower springs up in the rainy season and grows tall leaves and red-orange bracts which gradually fill with an aromatic, slimy liquid that smells of ginger. The clear, slimy juice can be used for softening skin or hair and bringing shininess to the hair as well as being dried and cooked with. Perhaps the most iconic of Costa Rica’s plants is the Hanging Heliconia which adorns most gardens. It is very vivid in colour and scent with its long, magenta and yellow tipped flowers. I think this plant is called red ginger and although it looks more pink here, it is often called pink cone ginger. It is a native Malaysian plants with showy flowers on long brightly colored red bracts. They look like they are already blooming however the true flower sits on the top and is small and white. Spot the hummingbird flying close to the Emperadora Flower. I didn’t take my best camera or lens but I’m quite pleased with this photo. These tiny birds fly so quickly its challenging to get photos of them. I think these brightly coloured birds are Scarlet-rumped Tanager, however they could be Red breast black birds. They could be both! They fly so quickly that you just see a streak of red fly past. It was very difficult without my nice, long lens, to get a good quality picture. Designed in the back of José’s garden, this is an excellent example of small-scale, eco-tourism. You can see birds, frogs, sloth and a vast number of local plants here. Jose is incredibly amenable to anything you want to see and having day or night tours. Costs start at $25 for a two hour tour. Photography groups are welcome and meals can be prepared too. We had a day tour with José however I went on a night tour in a different part of Costa Rica and it gives you a totally different perspective of the jungle. Below is the green tree frog at night. The quickest way to get in touch with José is through Facebook or his website as you must pre-book a tour. Payment is in cash when you’re there. Share the love by letting the Pinterest world know about this post.